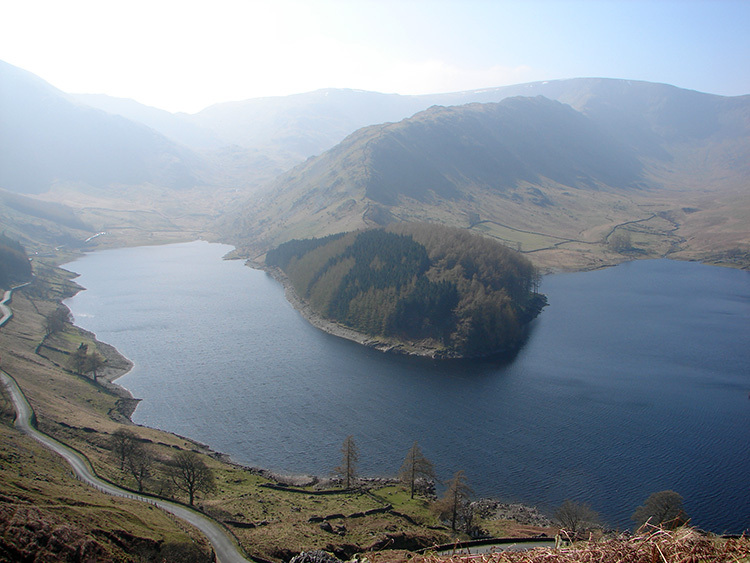 Summary: This walk starts a stiff climb up Gatescarth Pass but the hard work is rewarded once Branstree is reached for the views north and west to Haweswater and the High Street range are splendid. 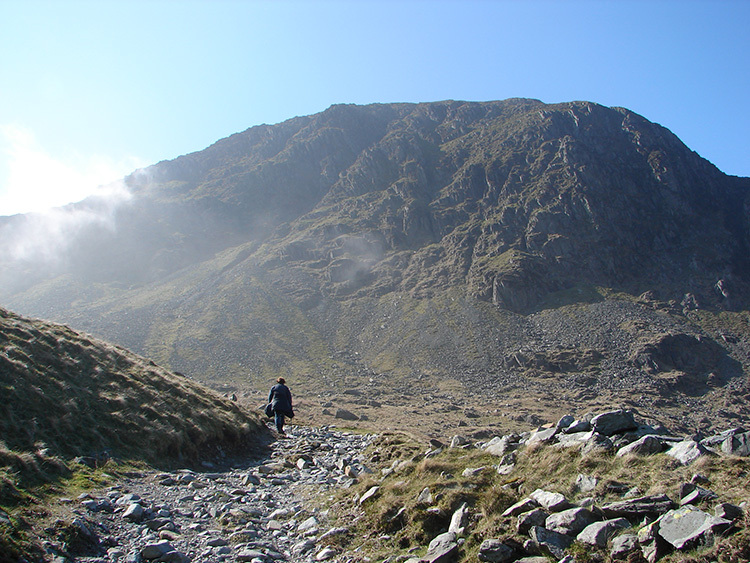 Then the wonderful Lake District fell terrain between Branstree and Old Corpse Road completes a wonderful walk. 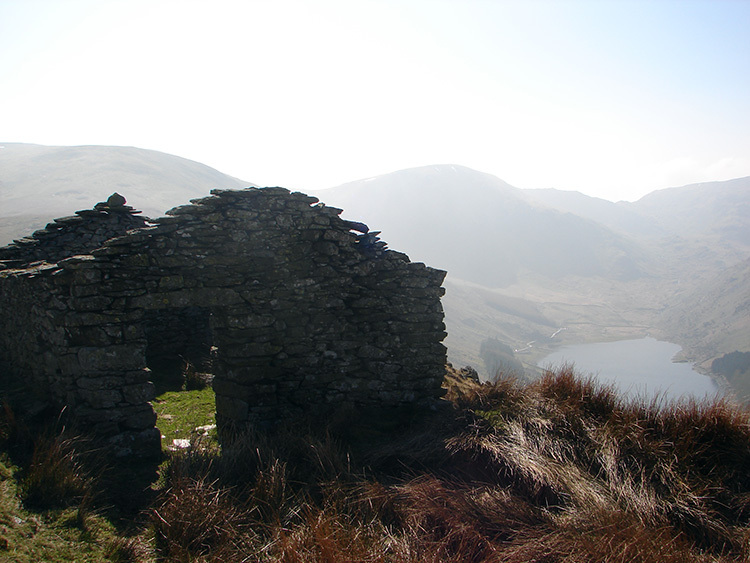 The objective of this walk was two of the less visited Wainwright Fells which command a charming position overlooking Haweswater Reservoir. Not always the case though for the huge reservoir is artificially risen by 95 feet in the place of a natural lake. I wish I had seen the valley before the Goliath size dam was built. 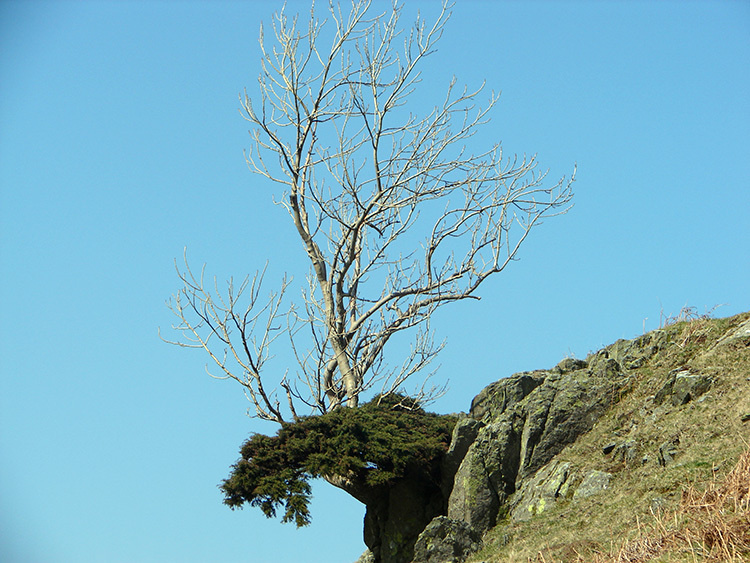 Still the valley retains a singular charm and it was a beautiful spring day whence Lil and I came to do the walk. 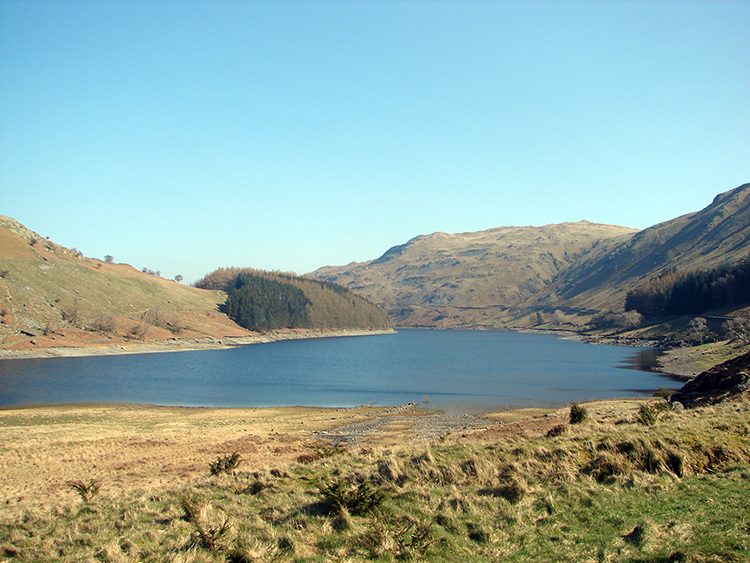 Lil had never been in the Haweswater and Mardale area before. 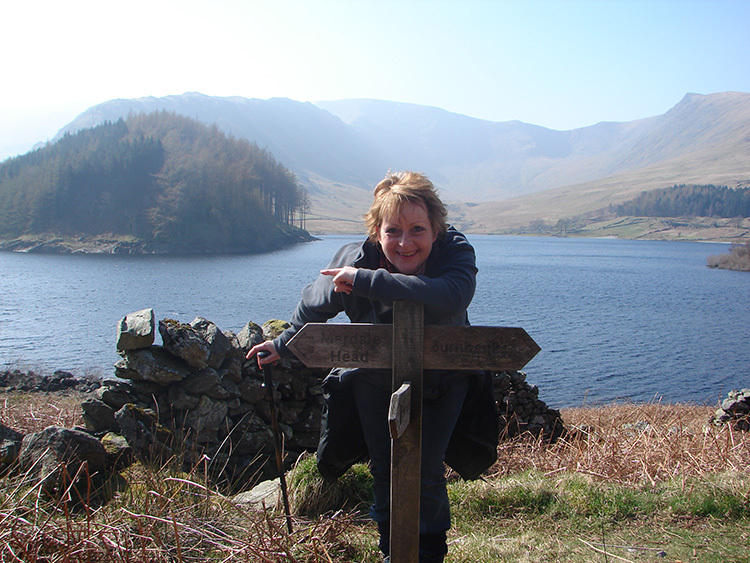 She was instantly struck by the charm of the area and in good spirits so I was with a willing walking partner as we parked up at Mardale Head to begin our walk. 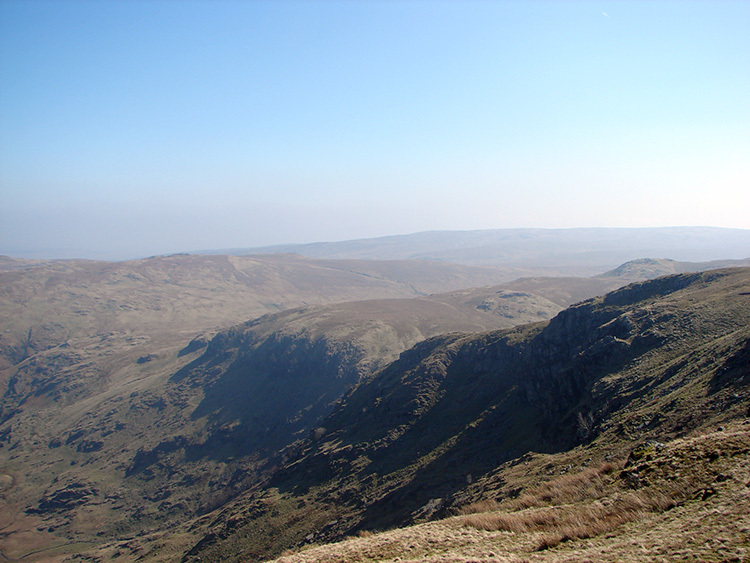 We set off to ascend the high ground via Gatescarth Pass and although we both were soon huffing and puffing we continued up in good form and keeping our eyes on the cloud ahead which was rising over the path head and then dispersing into the beautiful blue sky. After short sharp walks up the pass with regular intervals to catch our breath we were soon entering the cloud level at the head of Gatescarth Pass. At this point we had climbed 330 metres and after catching our breath once more we change course from the track to turn 90 degrees clockwise and head north east along a fence line to the summit of Branstree. 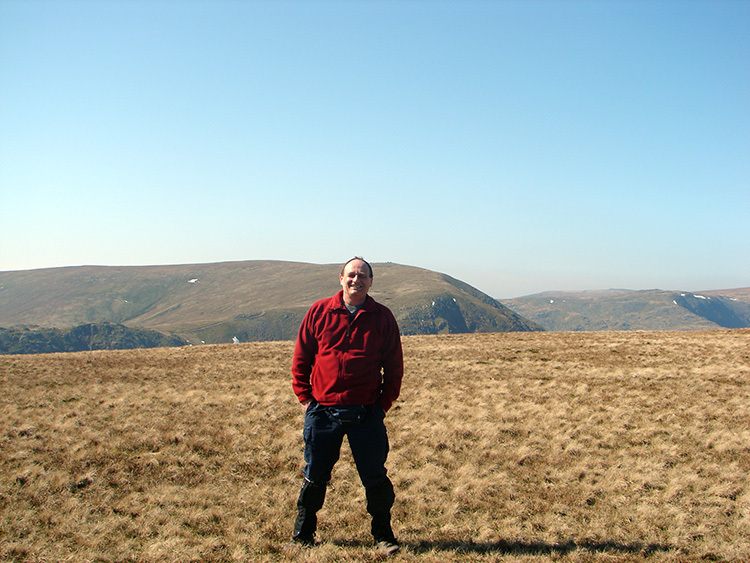 As Wainwright said the summit is a featureless plateau but it stands in a prominent position at the head of three valleys; Mardale, Swindale and Longsleddale (I will visit them all in time as I complete the Wainwright Fells). Despite its non dramatic top the achievement of attaining a height of 713 metres which was our upper limit for the day was rewarding for once we had reached the top we relaxed, took in the views and took in some food and drink. After all it was a beautiful day and a splendid spot for a picnic. After our short break we enjoyed a fantastic crossing from Branstree to Selside Pike, our other Wainwright Fell objective of the walk. The ground underneath was good and springy without a sign of being wet. 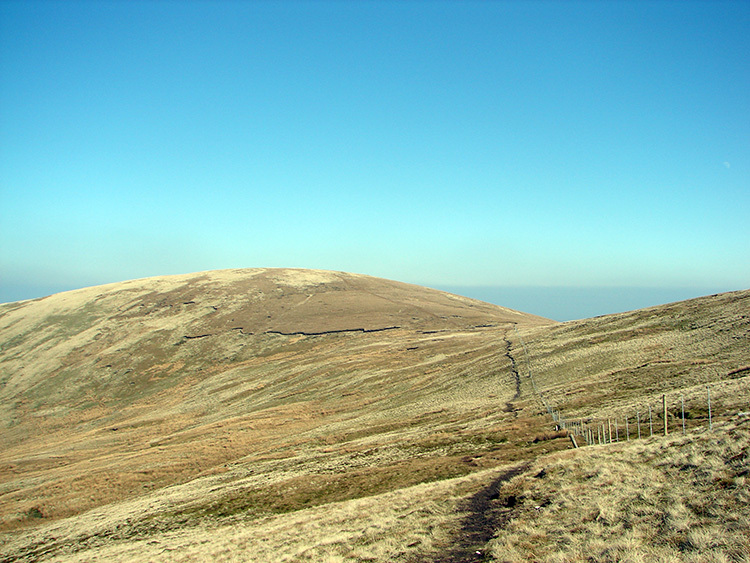 It was perfect fell walking for just over a mile until we reached Selside Pike where we met two girls and a dog, all from Penrith who like us were thoroughly enjoying being out on the high fells on such a lovely cloudless day. We continued on after a short chat with our temporary neighbours by dropping from Selside Pike to Old Corpse Road via High Blake Dodd and High Birkin Knott and thus avoiding marshy ground. Once we reached Old Corpse Road the going was again good. The walk west along Old Corpse Road was delightful. 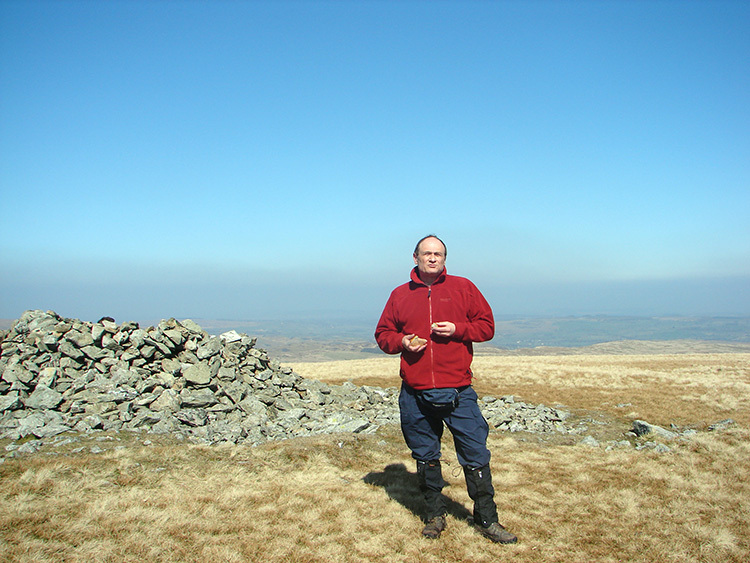 For the first kilometer it was practically level which allowed us to take our time and look around at leisure which gave us the opportunity to look at the hills all around and to the low Eden Valley in the east. We also revelled in the company of the local wildlife with many interludes caused by adult birds diverting us from nesting areas. We also saw many pools with active tadpoles, a bit early for the start of April we thought. After a while we started a steeper descent at the head of Rowantreethwaite Beck and had to be mindful of our steps. Soon we reached some old abandoned buildings. Lil thought the setting perfect for my holiday home! 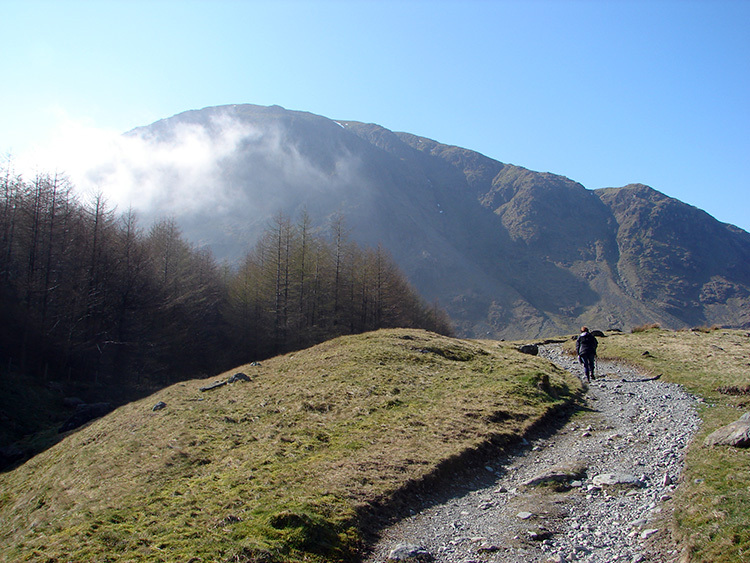 After the buildings the descent became steeper still and we were soon alongside two lovely waterfalls, one from Rowantreethwaite Beck and one from Hopgill Beck which joined soon after the falls to disperse into Haweswater Reservoir. 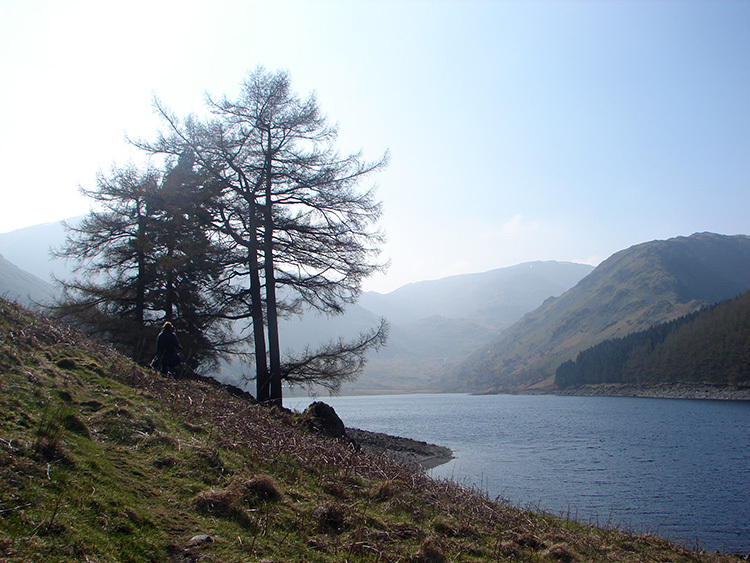 The views of the Rigg on Haweswater and the ridge to High Street were striking at this point and we both had to stop watching our feet to look up at the view on occasions. The final descent was steeper still and as a result we were soon down at the road. From here we could follow it back to Mardale Head or alternatively we could follow the reservoir track. The choice was simple, no road walking for us. Ever seen a mirage? During the reservoir bank side walk Lil began to tire and as a result of her increasing fatigue she was convinced the car was not getting any closer. I was suddenly afflicted too; the descent on a hot spring day had sapped our reserves and from euphoria we were both soon wishing the end of the walk to come. It turned out to be exactly one mile but it was a longer mile on level ground than the first one which we did by climbing 500 metres! Still we had enjoyed a fantastic glorious walk. We really had.